The best campground coffee is made in a camping French press or a special camping coffee maker. The aroma of coffee in the morning smells almost as good as the sun shining in a pine tree forest or fresh ocean air. 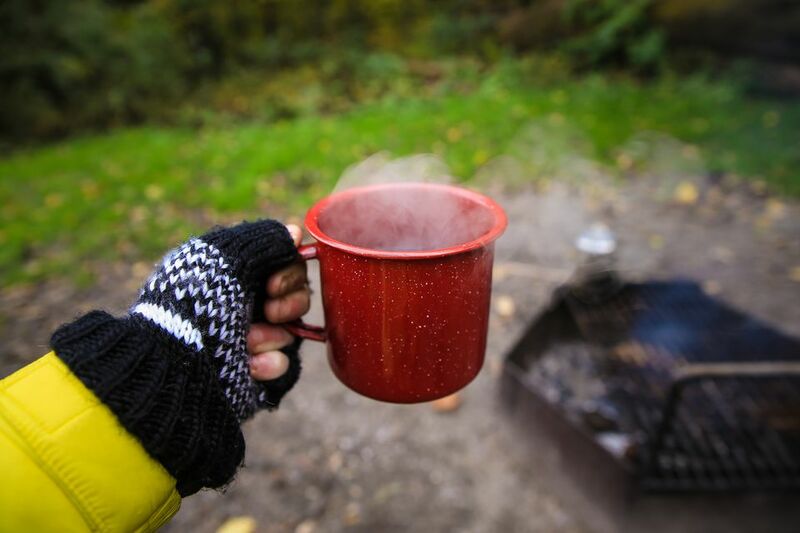 Every coffee lover agrees that making good coffee is important for a relaxing camping excursion, so don't suffer from instant or cowboy coffee. Chances are, if you're a coffee lover, you'll go to great measures to make the best cup whether you are camping, backpacking, or at home. But what's the best way to brew coffee when camping? It depends on your coffee drinking style and preference. The first step to making a delicious cuppa at the campground is selecting good beans, of course. Grind your favorite at home and pack the grinds in an airtight container. And bring more than you expect to consume because coffee always tastes better in the great outdoors. The following is a selection of favorite camping french press coffee maker options. If you love a good, rich cup of coffee then you'll love the Campware Stainless-Steel Java Press from REI. It is perfect for making coffee outdoors at the campground or in the comfort of your RV. The double-wall construction truly keeps your coffee hot and the 33 fluid-ounce capacity is perfect for serving one to four people. This press is sold exclusively at REI. If it is a regular cup of drip coffee that you love, then you might as well have it at the campground too. Coleman's 10-cup Portable Propane Coffeemaker brews a fresh pot of coffee just like at home. There is no longer a need to settle for lesser coffee at the campground. The coffeemaker holds up to ten cups of coffee and operates on a standard 16.4 oz. propane cylinder. The standard coffeemaker comes with a glass pot, but a stainless steel carafe option is available. The Snow Peak Titanium French Coffee Press holds up after a few years. At 6.3 ounces this titanium press is the best option for lightweight backcountry coffee-loving campers. The classic campground coffeemaker is a classic for a reason. Percolators make as good of a cup of coffee as the beans allow. If it's a hot and robust camp coffee that you're after, then a percolator is the best option. GSI Outdoors makes a variety of percolators at a range of prices. Try the ultra-rugged Glacier Stainless Percolator. It is corrosion resistant and made from marine-grade stainless steel and comes in 8, 14, 28 and 36-cup sizes. The MSR Mugmate Coffee Filter is most definitely the least expensive of the camping coffee makers mentioned here and arguably the most simple too. It's the lightest, smallest and makes good coffee one cup at a time. The personal-sized and reusable coffee filter sits in your cup. Just dump the grinds in and pour boiling water over the top. It weighs under an ounce and can be stored in your cup.